It’s now two years since we bought our Isuzu NPS 4×4 truck. For the last 6 months, we’ve also been living in our truck and Wedgetail Camper full time. Many of you are asking lots of questions about our setup. So we decided it was time to give you a “Year 2 Review” on how the truck is holding up, what we’ve changed or added and any issues we’ve had. We’ll cover the Wedgetail Camper in a separate article. And if you still have a question after you read through this, please ask away here. We’re more than happy to help out. Our Isuzu NPS 4×4 truck is finally getting some dust on it! We started full time travel in January this year (2018). Leading up to this our 4×4 truck didn’t really go off road much. We used it more as work vehicle in and around Wollongong and Sydney. From January however, it’s been a completely different story. The truck has done about 22,000km since then, mainly on dirt. And some of the roads have been horrendously bad. Just one example is here, fairly typical of what we’ve encountered. Roads like the Plenty Highway, Tanami Road, roads around Paruku, the Burke Developmental Road and so on. 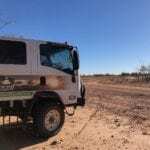 Lots of big corrugations, bulldust holes, ruts and washouts. Just one cracked weld on the tray. This was minor and easily fixed. Apart from this, no breakages inside or out. Just over 6 tonnes, well short of its rated 7.5 tonne GVM. The NPS 75-155 has a factory rear limited slip diff. This does make a difference. We accidentally demonstrated how well this works in a caravan park. Backing up over a gutter, both rear wheels dug a couple of holes into the dirt. Whoops! The front after-market ATB LSD is excellent. When in 4WD, this seamlessly engages when needed. You can feel both front wheels bite in and drag the truck up and over any nasty tracks. Once the moment is over, the LSD immediately dis-engages. Really, the front LSD operates as a locker… a fully automatic locker. Money well spent. Since the Year One Review of our off road truck, we’ve added quite a few bits and pieces. We’ve replaced our old inverter with a REDARC 350W pure sine wave inverter. This is in use pretty well constantly while we’re travelling. It powers the iPad for Hema Maps while we’re moving then our laptops when we’re stationary. This is powered from our dual battery system. We’ve added a dual USB outlet in the cab, both rated at 2.4A. These keep our phones, Go Pro and just about everything else charged. This is powered from our dual battery system. A Cel-Fi GO mobile signal booster sits in the cab. This boosts poor mobile signals, giving us more range and a usable signal in poor reception areas. This is powered from our dual battery system. We’ve added sound and heat proofing to the rear of the cab. In summer, the heat coming up through the floor and engine tunnel is pretty severe. A 3 micron Donaldson water separator sits inline after the primary fuel filters. This is cheap insurance against dodgy fuel. Thankfully, it hasn’t been tested yet! The rear bench seat fits four adults. We cut down the seat squab (base) into two individual seats. These sit at the ends, near each door. 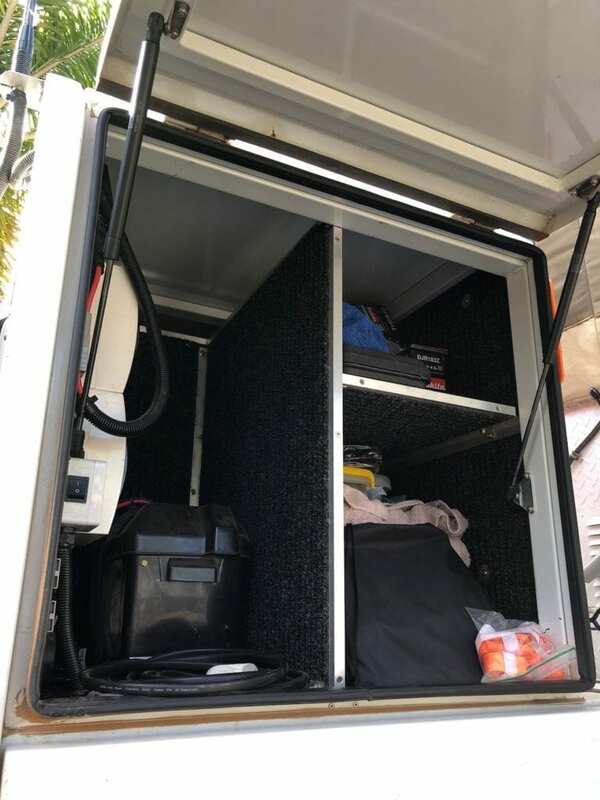 In between we have a storage compartment for storing clothes, electronic gear and so on. It’s also provided a spot for mounting the inverter, Cel-Fi GO, USB outlet, switches and wiring. You can see the storage compartment in the video in this article. We’ve fitted some shelving in the storage boxes. The shelves are made from timber, bolted together then covered with marine carpet. This is working well. The shelves can flex without breaking. Timber shelves are bolted together using alumium angle and bolts. This allows them to flex without breaking. We’ve added LED lights in the storage boxes and the rear of the cab. These are powered from our dual battery system. Yes, the DP Chip has been removed. Why? When we had a fuel issue (see “Any Problems?” below), we removed it for two reasons. Firstly, I wanted to eliminate the DP Chip as a potential cause of what was a mystery fault at the time. Secondly, when we had the fuel starving issue, we did not have any fault codes on the dash. While trying to figure out what the problem was, I spoke to several experienced Isuzu technicians. They were all surprised when I told them the engine warning light never illuminated or indeed any warning lights at all. They all said we should have seen the engine warning light illuminate if the fuel rail was starving for fuel. A few of them asked whether we had a chip. When I told them the DP Chip was plugged in after the ECU, they all suspected the DP Chip was masking the fault codes. Whether this is correct I don’t know. However, I made the decision to remove the DP Chip. I may re-install it, but it’s unlikely. The original Powerdown adjustable shock absorbers weren’t up to the challenge. They are rebound shocks, meaning they do very little on the compression stroke. The result was a rough ride, with the front hitting the bump stops regularly. So we fitted a set of gas shocks. The difference in ride is unbelievable. I actually had a suspension driver’s seat on order, but after fitting the new shocks I cancelled the order. The ride has been transformed. Quality gas shocks make a huge difference to the truck’s ride. While we haven’t replaced them yet, we will soon. With rego coming up soon, the tyres are at the point where they are marginal. We’ve been experimenting with tyre pressures for ages now. On road, we’ve settled on 85psi (cold) at the rear and 75psi (cold) at the front. Off road, we run 55-60psi (cold). These pressures give a good compromise between ride quality and heat build-up. There’s only 5psi difference between them hot vs cold, so we’re close to the mark. 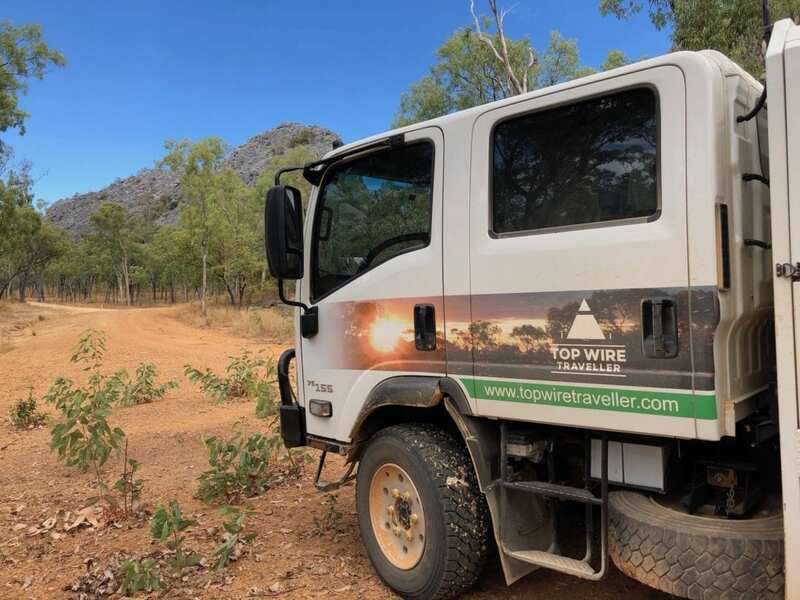 Update: Since writing this article, I have spoken to Toyo Tyres Australia and received some excellent expert advice from Technical Manager, Steve Burke. Go here for a review on our Toyo tyres. 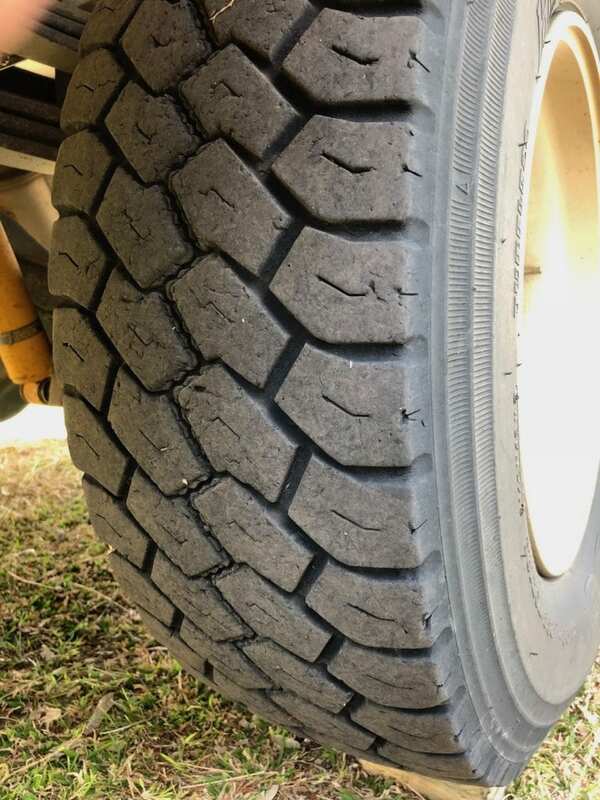 Hard to see here, but the tyres are worn on the edges. There’s a fair amount of feathering as well. Just one comment on the Toyo Hyparadial tyres. At the risk of sounding like an advertorial (which it isn’t), they are brilliant. They have copped an absolute hammering over the past six months. 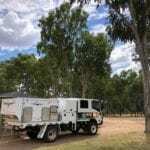 Millions of sharp rocks, sandy country full of those dreaded mulga and gidgee stakes, yet we’ve had no problems at all. Yes they’re expensive. However, I’ll have no hesitation in getting the same tyres fitted again. Probably the only disappointing thing is the life. As I said, the edges are marginal and the centres are okay. We’ll be replacing them at around 70,000km. We were hoping for at least 80,000km from a set. To be fair, I did get slack with the tyre rotations. I was rotating them every 10,000km but let them go from 30,000 to 55,000km before rotating them. During this time, the tyres on the outside edges on the front and rear passenger side did wear pretty badly. So this certainly didn’t help with tyre life. We still haven’t done much with the passenger’s seat, except add foam padding under a seat cover. This seems to be an on-going issue in dual cab Isuzus because you need to access the engine under the passenger seat. Therefore, we’re very limited in what we can do here. We’re getting 2 x 40 litre water tanks fitted behind the rear wheels, one set on each side. So we’ll have an extra 160 litres on board. We’ve found the 90 litre water tank in the Wedgetail Camper isn’t enough. In the interim we’ve been carrying 4 x 15 litre water containers on the floor in the back seat. We were going to get a sullage tank fitted for grey water. However, we’ve been using a 20 litre jerry can. This has proved to be a good solution, so we’ll continue to use the jerry can. This is a low priority and we probably won’t bother. Vision from the cab is excellent. If in doubt – for example backing up to turn around on a tight bush track – I just jump out and make sure there’s not a huge tree hidden behind us! We’d still like to get one, however this is probably our lowest priority at the moment. We’ve had one major drama. A couple of times, the truck stopped by itself a minute or so after starting. We then restarted it and off we went. It seemed like it was starving for fuel. 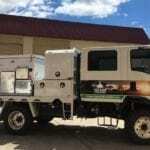 We took the truck to an Isuzu dealer in Queensland (which as much as I’d love to, I won’t name) and asked them to go over the fuel system, as we were heading into some remote country in the Northern Territory and the East Kimberley. The dealer assured us they’d blown air back through every hose to check for leaks but couldn’t find anything. They changed all the fuel filters while they were at it. A few weeks later after travelling the Plenty Highway, along the Tanami and into Paruku, we stopped near the end of the Tanami for a break. As soon as we pulled up, the truck was idling roughly, coughed a few times then stopped. After bleeding the system, it re-started but wouldn’t idle below 1,800rpm! 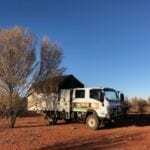 We made it into Halls Creek, rolled into the fuel bowser after stalling, filled up, bled the system, got it going then legged it over 350km to Kununurra. This was an interesting trip to say the least, with one lane bridges, roadworks and a couple of T-intersections. Fortunately the stop/go gods were on our side and we were able to keep moving. We found a fantastic diesel mechanic in Kununurra. He actually did what the Isuzu dealer was supposed to do a couple of months earlier. He blew air through each hose and found the supply hose leading up to the engine was loose both ends, therefore sucking air. Problem solved! How did this happen? It wasn’t an original Isuzu fault. We’ll put this down to human error and leave it at that. These things happen when a system is modified from original specs. We’re just relieved it was fixed and no longer an on-going intermittent fault. 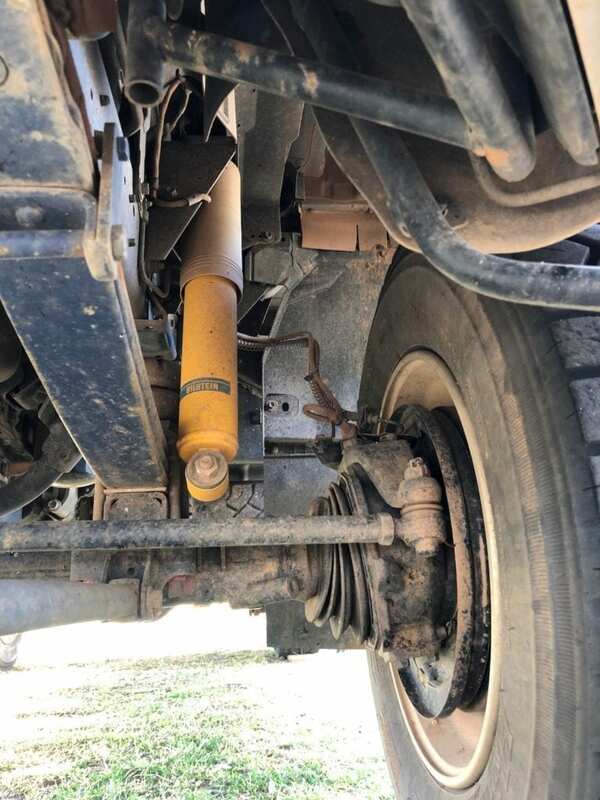 A big thanks to Chris Campbell from All Terrain Warriors and Craig Kennedy from Dwyers Trucks, Nowra for their help in troubleshooting this issue. Yes, we love our 4×4 truck. Sure, we’re slow and it does ride like a truck. However, the space in the cab and the panoramic view simply can’t be beaten. More importantly though, this truck is simple and really strong. Over the past 6 months, it has copped a pounding. But with live axles at both ends, leaf springs and shocks, there’s really not much to go wrong. We really can’t ask for much more than that! NOTE: The REDARC inverter mentioned above was supplied to us free, in return for a review. (That said, our reviews are always honest and authentic – we tell it how it is). Isuzu NPS Fuel Economy - What Should I Expect?